Stock broker used to be one of the hot favourite job that many people want to be, not sure how people think about this career now. 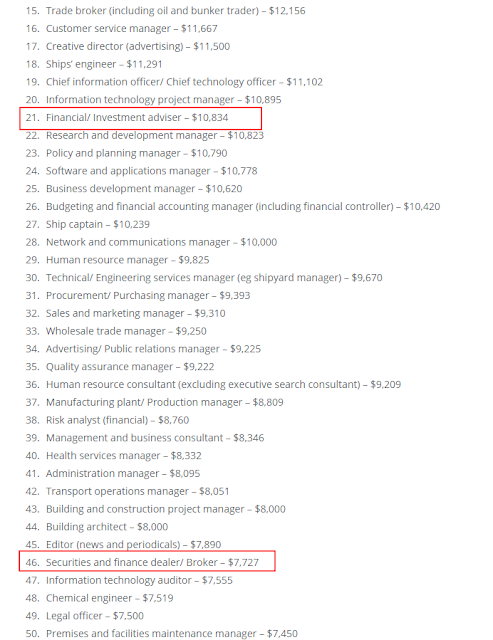 Recently an article came out showing the Top 100 paying job in Singapore. It shows that Securities and finance Dealer/ Broker $7,727. and Financial / Investment Adviser earns about $10,834. How you think about this money? Good? The good news is actually you can actually be dual license Financial Advisor and Trading Representative in Phillip Securities. To find out more Drop me a message now! We will be having a How to be a Stock Broker in Singapore seminar soon, Register for your interest!